Rated as one of the Best in Newfoundland! Click here to see where we are located!! Explore an unforgettable dining experience at The Norseman Restaurant in L'Anse aux Meadows.The prices are very affordable and the quality of cuisine is amazing. Relax in the restaurant next to a warm fire . 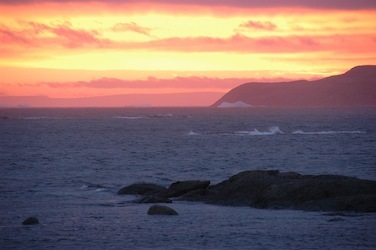 Take in a fabulous view of the ocean where whales and Icebergs cross paths as the sunsets in front of you. Select your wine from an extensive list as our chef prepares locally harvested seafood, wild game and other specialties. Legendary fish chowder. Smooth butternut squash, sweet potato, onion, root vegetable (beet, parsnip and rutabaga), asparagus Soups.., Large scallops in white wine sauce... aromatic baked cod in Dijon mustard sauce... juicy striploin steak... local lamb... delicate mouth watering fresh local cod fish and lobster.. All served with steaming or roasted fresh vegetables. And for dessert.. tart partridgeberry pie... sumptuous chocolate mousse with local berries... fresh European fair-trade coffee.. and drinks served with iceberg ice- the purest on the planet. Pick your lobster with the Chef at the Wharf. We do have children's and vegetarian's selections.The Norseman also has the freshest and most flavourful lobster you will ever encounter. How fresh? Well, the lobsters are kept in an enclosed crate in the ocean, just feet from the restaurant. Come pick your own with the chef. Check out the Gaia Art Gallery while you dine. We have a variety of fine Newfoundland and Labrador Art, such as soapstone, moose antler carvings, orginal paintings and prints , T- Shirts, Swedish jewellery, Innu teadolls, sealskin slippers, watercolour and oil paintings, local photographs. We also have excellent selection of books, Viking games and Newfoundland and Norse music. Our prices are reasonable because we deal with the Artists directly! We are able to accommodate up to 50 people. Frommer's tourist guide gives us three stars, that is the best you can get from Frommer's. 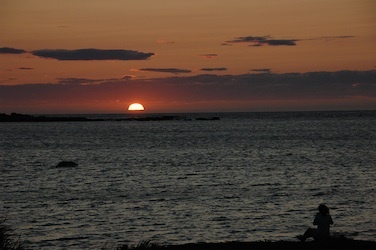 The most spectacular sunsets can be viewed directly in front of the restaurant.Feel free to request a window seat. People who have dined here are amazed at the quality of the cuisine in this restaurant. We are located at the end of Route 436 in the Village of L'anse aux Meadows( a town of 28 people). Our focus is on using local and fresh products. We are concerned about our own health and the heath of our clients , when we prepare food! Being advocates of healthier eating for a better life, we prefer not to serve processed food, even though it would be cheaper for us to buy and help us financially with our bottom line. Distributors try to convince us that their processed foods (example: stocks for soups) are just as good however, organic, fresh products are better and healthier.We have healthy options as accompaniments including the following; quinoa with maple syrup roasted sweet potato, lentils, asparagus, green beans, roasted red peppers, rice with purple cabbage and saffron, Belgium endives, caramelized fennel, wild mushroom rice., etc. It's great that we can contributing to healthier lifestyle for people and believe that it is not all about the financial gain when running our business! We serve the freshest seafood you will ever taste!! Click photo to see how fresh! We are so fortunate to be able to buy local cod all summer long since the inshore cod fishery open on different coasts of the province throughout the summer. 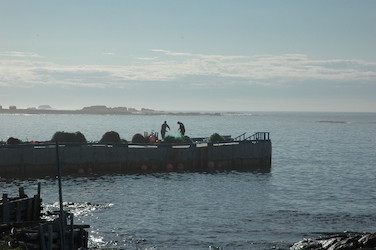 We are located or within 40 kms of both coasts ( East and West); For example Goose Cove and St. Anthony are considered to be on the East side and L'Anse aux Meadows to Cooks Harbour is considered to be on the West side, hence they will have different times that local inshore fishermen would be allowed to harvest fish throughout the summer in the region. In St. Antony(40kms from L'Anse aux Meadows) there is a crab and shrimp processing plant and cold storage, hence these fish products are readily available to us throughout the summer. In Griquet/St Lunaire ( 16kms from L'Anse aux Meadow) there is a mussell farm where the freshest large blue mussels you will ever taste are harvested. In Cooks harbour ( 60kms) we are able to source fresh local bay scallops. In Raleigh we get fresh local Newfoundland lobster( sweeter than other maritime lobster because of the colder waters in lives in). We are also able to hold our lobster over the wharf for the summer and even though the lobster season ends on July 1st, we can still serve fresh local lobster until August month. Look for the Mermaid! They frequent this area often! This is the view from the Norseman Restaurant in L'Anse aux Meadows. This is one of the best places in the world to see icebergs and sunsets! It is a magical place where you can imagine romatic tales; a flaxened hair Viking and a Beothuk Indian romance (that is forbidden by their clans). An angry sea captain of nobel blood who forbade love between his niece and her young handsome , exciled lover. The captains anger was so intense that he marooned them on a cold desolate island in the North Atlantic. 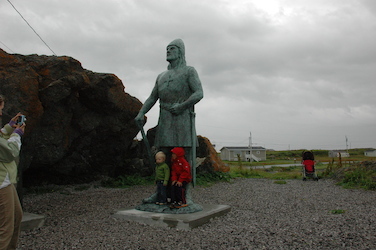 A Leif Erikson Statue donated by the Leif Erikson International Foundation was erected in L'Anse aux Meadows on July 31st ,2013 on the wharf in front of the Norseman Restaurant! Come plan you experience with the Norseman restaurant to include a visit to our 10 foot bronze viking friend( located only 100 meters from the Norseman)! You can also incorporate a walk along the seashore if you have dined early and would like to see the incredible sunsets after dinner! On June 21st the sun doesn't set until 9:30p.m. On July 21st it sets around 9:00p.m. On August 21st it set at around 8:30p.m. This is to give you an estimate of when it might set when you visit us! Plan your visit to come early( arriving at 5-6p.m.) 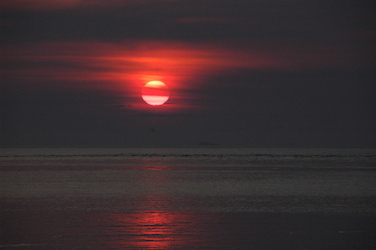 , dine and then go for a nice walk along the sea shore or dine later( arriving at 6:30p.m.-7:30p.m.) while the sun is setting. Download the "appfurnace player" app to your iphone or android phone and Scan this code from your desktop or another device or enter the following website address; the.appfurnace.com/test/BN15t/ . 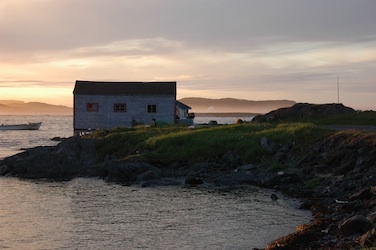 You can listen to stories as you travel on the Northern tip of Newfoundland. It is a work in progress ! I have added quite a bit of information but will interview locals this coming summer to add more! Update before you leave so you will have the most recent information!